I'm not sure if this is good timing or if it's a result of some recent developments, but I would like to thank Cee of Living A'La Mode for passing it on. I am no writer by any means but everything I post on this blog is all MINE! I would rather let a task expire if I can't write anything original about it rather than copy somebody else's content. If and when I need to copy and paste something here in my blog, I make it a point to give credit where it's due. According to Dictionary, Plagiarism is the unauthorized use or close imitation of the language and thoughts of another author and the representation of them as one's own original work. thank you!!!!! hahalikan ko pati ang maker ng tag na ito. you know what I'm hoping for? that she will be banned forever sa blogging companies. I'm sure she has MORE UNKNOWN VICTIMS. because kung hindi ka lagalag like me, it is really hard to find out who steals from you. Tnx Juliana for taking part in spreading this Tag! 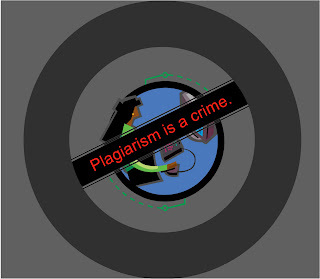 Personally, i am not aware if anything on my page has been scraped but the stories i have heard from a Mommy group (whose members also Blog) here in our place about Online Plagiarism are enough to make me feel impelled to write about it. I just hate people like them -- to the nth degree. what an excellent campaign, mommy J. just in time kasi nga dahil dun sa nangyari kay Juliana though i know ang dami ng copycats before pa.